Soar high above the clouds when you play Skyway and earn your fortune in this medieval aeronautical adventure. Skyway is filled with globes and travel related symbolism along with the usual standard of lettered symbols. The colour scheme on Skyway is ethereal, to say the least and will certainly have you feeling like you’re on cloud nine when you match up the symbols and win some significant cash rewards. Check a this list to help you find all our online slots here! Masters in the art of creating classic, physical, and contemporary online slots, Playson currently have more than 40 hit titles on the market. Priding themselves on their ability to deliver original, custom games upon request, their adaptability in design and delivery shines through in their commercially released titles; each one combining innovative gameplay with classic themes and creating impactful gaming solutions. For more of their games, follow the link for online slots games. It’s time to take to the skies with Playson’s latest aerial challenge. This 5 reel, 3 row and 21 payline online slot puts us in the cockpit of a massive airship, and takes us back to the time when the conquest of the skies was crossing from the realms of imagination, into revelatory innovation! Seeing the world as people once only dreamed of, Skyway is our aeronautical route to the lofty heights of online gaming success. This game has captured the interest of imaginative players and considers this to be the best video slots ever played, according to their preference. We navigate our way to victory with 3 detailed characters; a wise old engineer, capable of crafting these massive marvels of the modern age, a reliable, dangerously charming crewman, and a beautiful, fearless female pilot – certainly a pioneer of the age, and setting a fine example for the likes of Amelia Earhart! The pilot is by far the most valuable symbol on the board, and acts as the Wild amongst a plethora of wonderfully detailed mechanical and aeronautical symbols - including a trusty Globe and mechanical innovations of the era. Finding 5 of the pilot characters on our reels will trigger a stratospheric win of 9000 times our bet. However, while we’re waiting for that win to take-off, we can always join the captain herself for a quick game of chance in the cockpit. After every successful spin, we get the chance to take her on at cards, with a guess-the-suit mini-game giving us the chance to quadruple our winnings. The amazing Airship is the Scatter of the game, and triggers 16 Free Spins every time we land 3 or more anywhere on the reels. With detailed animations playing out after every win involving the character symbols, and an engaging, adventurous soundtrack being matched by the excellent sound effects, from just £0.21 an airborne spin (up to £105.00), this epic Playson slot is fast-paced, fun, and wonderfully adventurous. Set against the backdrop of an incredible, picaresque vista of an evening skyline – with an emphatic ‘sky’ – this online game is simultaneously playful, challenging, and rewarding. It has a classic, arcade slot feel to it, and is delivered with the fun and impact of the modern titles we know and love. 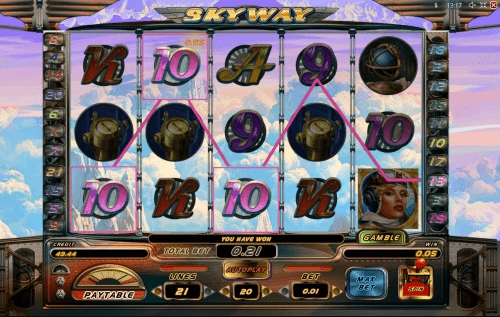 With Sky Way, we get to experience the traditional fun of a physical slot game, the excitement of a visually stimulating arcade, and the excitement of a modern, 5 reel slot. Playson have gone to town on the detail in the graphics and sound effects, including a range of excellent animations that we see regularly, after the frequent wins that Sky Way provides. Wizard Slots particularly enjoyed the sense of adventure that resonates throughout the game. 9/10. One of our best games that you might want to try is our aloha slot.